Nestled in "the City of a Hundred Horizons," Hotel Villa Cipriani is the ideal spot for travelers seeking an enchanting Northeast Italian destination, surrounded by a beautiful landscape with endless views. The medieval walled town of Asolo is known for its views from the top of the Asolan Hills, a valley filled with olive and pomegranate trees, and nearby mountains. Formerly the private estate of famed English poet Robert Browning, this charming boutique hotel is enveloped by lush, perfumed, blossoming gardens. Hotel Villa Cipriani features 29 guestrooms and suites, furnished with genuine antiques, extravagant linens, and details of fine Italian craftsmanship, such as hand-painted ceramic tiles. All accommodations offer complimentary WiFi, a minibar, and views of the gardens or countryside. Guests can unwind at the hotel's Wellnesspace, fitness center, and award-winning outdoor pool. Complete with sun loungers, a Jacuzzi, a nearby snack bar, and views over the valley, the infinity pool has been named as Best Italian Pool in the 2014 Italian Pool Award. After a day exploring the countryside or relaxing at the pool, guests can dine on authentic Venetian and Mediterranean cuisine at Villa Cipriani Restaurant, a fine dining establishment serving fresh, seasonal, local food. Hotel Villa Cipriani is an enviable four-star getaway, offering breathtaking sights, and complete tranquility, guaranteed to leave all travelers feeling rejuvenated. 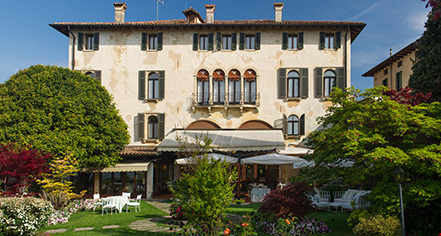 Hotel Villa Cipriani, a member of Historic Hotels Worldwide since 2016, dates back to 1899. Famous for hosting queens, artists, and captains of industry over the years, notable guests of the hotel include Juliana of the Netherlands, Prince Philip of Edinburgh, the Queen Mother of England, Marcello Mastroianni, Vittorio de Sica, Orson Welles, Peter O'Toole, Catherine Deneuve, and Kim Basinger. Accessible Rooms: Accessible rooms are not available. Pet Policy: Service animals allowed: Yes. Pets allowed: Yes. Fee: Please contact hotel. Restrictions may apply. 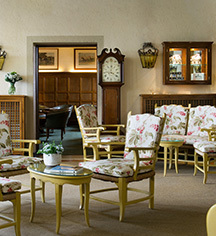 Learn more about the History of Hotel Villa Cipriani .